Shared child care may be the secret of human evolutionary success. In every human hunting-and-gathering society about which we have information, mothers allow others to hold newborns. But how could selfish apes ever make the transition from mother-only care to such cooperative breeding? At some point in the emergence of the genus Homo, mothers must have become more relaxed about handing even quite young infants over to others to temporarily hold and carry. No infant is more costly than a human one, and a growing body of evidence from traditional societies makes clear that wherever rates of child mortality were high, children with alloparental provisioning were more likely to survive. 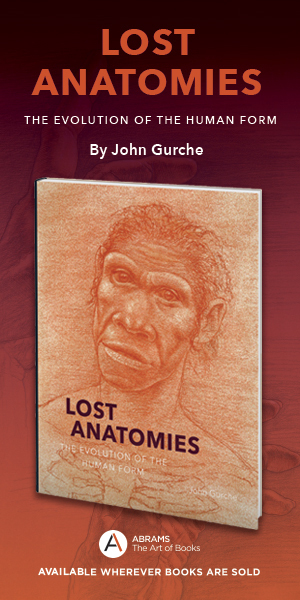 I believe that was the case among our ancestors in the Pleistocene. 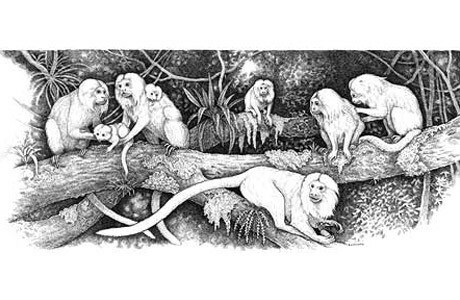 Pen and ink drawing of golden lion tamarins by the artist Sally Landry beautifully illustrates the patterns of child-rearing found among marmosets and tamarins belonging to the subfamily Callitrichidae. Typically, a single alpha female in the group will give birth to twins that are then carried most of the day by one or more of the adult males that the mother has mated with (they are passed back to the mother when they need to suckle). Other group members, like the subadult male in the foreground, catch beetles, frogs and other small prey to feed the infants around the time they are weaned, a time when youngsters are especially vulnerable to malnutrition. Among ethnographically recorded hunter-gatherers, provisioning by allomothers starts early and goes on for years, beginning with “kiss-feeding” of unweaned infants with saliva sweetened by honey or with premasticated mouthfuls of other food. That encourages infants to pay attention to others, including their own mothers, with whom they are eager to maintain visual and vocal contact. 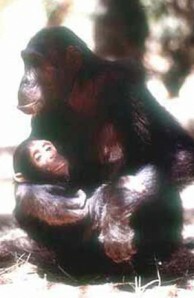 An infant temporarily out of its mother’s arms will spend more time monitoring her whereabouts and looking at her face. Youngsters also have a big incentive to learn who else might be available and willing to care, and children with several trusted attachment figures learn to integrate multiple perspectives. In the words of pioneering child psychologists Ted Ruffman of the University of Otago and Josef Perner of the University of Salzberg, “theory of mind is contagious”—you catch it from older siblings and other caretakers. Among our Pleistocene ancestors, infants with multiple caretakers would have been challenged in ways that no ape had ever been before. The needy youngster would have had to decipher not only its mother’s commitment but also the moods and intentions of others who might be seduced into helping. How best to attract care in varied circumstances? Through crying? With smiles, funny faces, gurgling, or babbling? The youngster best at mind reading would be best cared for and best fed. Such novel (for an ape) selection pressures favored a very different type of ape—one that we might call emotionally modern. 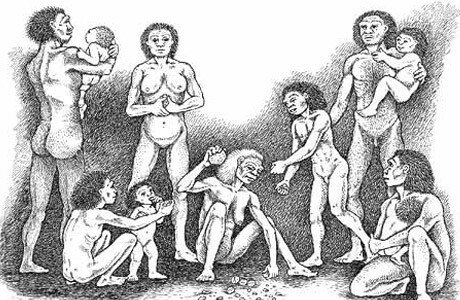 Artist’s rendering of Homo erectus, ancestral humans who lived in Africa in small groups as early as 1.8 million years ago: The woman in the center is cracking open nuts, while parents and other group members (so-called alloparents) help take care of infants. Shared care coevolved with empathetic awareness; mothers and infants benefited from intuiting who would help and who would hurt. Almost all primates live in social groups, and it is generally advantageous for a mother to be in a group that includes close kin. Their help is especially critical when an inexperienced young female first gives birth. In most social mammals, and in the majority of monkeys, females remain with the group where they are born, and maturing males strike out to make their fortunes. But among our nearest living relatives, the great apes, only a tiny minority of new mother apes ever have matrilineal kin nearby. Evolutionary biologists have taken for granted that, like other apes, our female ancestors must have left their natal groups to breed in another community. There they would have encountered unrelated females, possibly competing mothers, who might be not only unsupportive but actually infanticidal. Until recently, in fact, evolutionary biologists assumed hunter-gatherers followed a similar pattern of female dispersal. But in 2004, in an exhaustive review of ethnographic studies, University of Utah anthropologist Helen Alvarez concluded that mothers living in hunting-and-gathering groups were likely to have their mothers and other kin nearby when they gave birth. 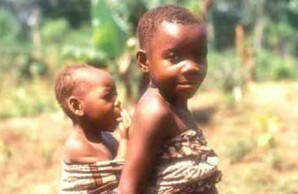 For example, Stanford University anthropologists Brooke A. Scelza and Rebecca Bliege Bird found that among the traditionally polygamous Mardu hunter-gatherers of Australia’s Western Desert, older mothers would relocate to be near daughters of childbearing age, especially if the daughter lacked an older cowife to advise and help her. Mothers were also eager to join a daughter if she was married to the same man as her sister. In consequence, half of married Mardu women between the ages of fourteen and forty had a mother in the same group, while many had sisters or cousins as well, often as cowives. On average, female group members had an 11 percent chance of sharing a gene by common descent—just as do females of some of the nonhuman primate species that practice infant-sharing. Something happened in the line leading to H. sapiens that encouraged female relatives to stick together. The impetus, I believe, had to do with food. Chimpanzee mother with her baby in Gombe National Park, Tanzania: although considered the closest living relatives of humans, in the Great Ape (chimpanzees, gorillas, orangutans) mothers are highly possessive of their infants and do not allow other group members to share in their care. By 1.8 million years ago H. erectus had new ways of finding, processing, and digesting food needed to support both larger bodies and energetically more expensive, larger brains. The most plausible scenario, set forth by anthropologists James F. O’Connell and Kristen Hawkes of the University of Utah, is that long-term trends toward a cooler, drier climate leading up to the Pleistocene pressured the precursors of H. erectus to supplement a diet that had consisted mostly of fruit and occasionally meat. Game was increasingly important, but its availability unpredictable. A division of labor emerged between male hunters and female gatherers, and social bonds ensuring that men and women shared became increasingly essential. O’Connell and others suggest that when other foods were scarce, our ancestors relied on the large underground tubers that plants in dry areas use to stockpile carbohydrates. Those storage organs occur throughout the savanna, but are protected by a deep layer of sunbaked earth. Savanna-dwelling baboons dig up rhizomes and undergound stems called corms, both found nearer the surface, and at least one unusual population of savanna-dwelling chimpanzees is known to use sticks to dig out the shallower tubers, suggesting that early bipedal apes may have done so as well. But it takes special knowledge and equipment to dig out the deeply situated larger tubers. Tubers are not only hard to extract. They are fibrous and difficult to digest, hardly ideal food for children. Like nuts, they need skilled processing. To eat them, weaned juveniles would have to depend on capable providers. Nevertheless, evidence is increasing that starchy tubers were an important fallback food for African hunter-gatherers. A 2007 report in Nature Genetics revealed that people like the Hadza of Tanzania, who rely on roots and tubers, have accumulated extra copies of a gene that makes an enzyme useful in the digestion of starch, salivary amylase. While we can’t test the saliva or sequence the genes of African H. erectus, isotopic analysis of their tooth enamel yields results consistent with a diet substantially reliant on underground roots. Once H. erectus developed the use of fire, perhaps as early as 800,000 years ago, roasting tough, fibrous tubers would have rendered them more digestible, and more useful still. Even before cooking, the addition of tubers to nuts and other plant foods gathered and processed by women would have provided new incentives for food sharing between hunters and gatherers, as well as new opportunities for postreproductive women motivated to share. In their “grandmother hypothesis,” Hawkes and O’Connell propose that Darwinian selection would have favored experienced, hardworking women who live on for decades after menopause, not just for a few more years, as in other primates. Such women could help provision younger kin, without the distraction of infants of their own. In central Africa, an Efe girl carries an infant, a common helper role that allows a mother to give birth again before her infant has attained independence. Ethnographic studies of such traditional hunter-gatherers living in small, tight-knit communities, provide insights into how early humans kept children alive in the Pleistocene. Across traditional societies, where it is not unusual for 40 percent or more of individuals to die prior to maturity, mortality rates depend a lot on family composition. Not surprisingly, presence of the mother matters most. The father’s impact varies from being vitally important to having no detectable impact, depending on local conditions and who else is around to help. When it comes to alloparents, older siblings and grandmothers, especially maternal grandmothers, have the most reliably beneficial impact. Under some circumstances, their presence cuts the chance of dying during childhood in half. In purely practical terms, we can envision a sequence that begins with hunters and gatherers sharing the fruits (and tubers) of foraging and then moving toward cooperative breeding. That would have allowed our Pleistocene ancestors to produce young that depended on many caretakers for a long time. No ape produces such big babies that mature so slowly, yet not only did our ancestors manage to survive, but our species eventually expanded beyond Africa and around the globe. In terms of cognition and emotions, the transformations wrought by shared care and provisioning were even more profound. Our bipedal ape ancestors were surely as clever and manipulative as are living chimpanzees, able to manufacture and use tools; they must have been at least as empathetic in some circumstances, and endowed with a rudimentary theory of mind. But when they adopted what was, for an ape, a novel mode of rearing young, one that produced individuals more mutually tolerant and other-regarding than other apes, they laid the foundations for ever higher levels of empathy and cooperation. In such modest beginnings we can identify the groundwork for spectacular later developments. This article was adapted from Mothers and Others: The Evolutionary Origins of Mutual Understanding, by Sarah Blaffer Hrdy, ©2009, published by Harvard University Press. On sale in bookstores in April. Click here for ordering information. The Pictorial Guide to the Living Primates features color photographs of 234 species of primates along with basic information and a range map for each. 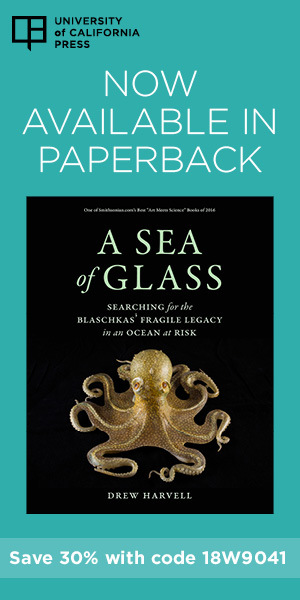 Click book cover image for ordering information. Anthro-Photo (www.anthrophoto.com) provides clients with images provided by scientists from long-term field studies with a focus on disappearing cultures. Anthro-Photo features Anthropology, Biology, Paleontology, Archeology and Animal Behavior from researchers at Harvard and other major Universities. We provide scientifically accurate images with captions that are fact-based, not “guessed at” by the photographer. Our pictures aren’t “set up” or taken at a tourist demonstration of what the cultures used to do. Our photographers were there, they lived in the field, they are the authorities on the cultures and animals they photographed.